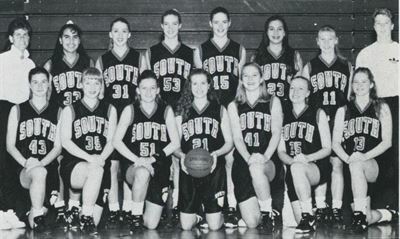 The 1993-94 Women’s Basketball Season started with a bit of stability. For the last three years, new coaches came and went. Head Coach Debbie Kern returned for her second year, giving the team stability. The practices Coach Kern provided were challenging and pushed the players to do their best. Kern’s expertise inspired the players as well. The conference season began with a game against Washburn. The Millers were the first victim of the season, losing 60-46. Henry was the second game. The Patriots were no match for the Tigers, falling 77-31. The Polars were the next opponent. South put up a good fight but went down 63-58. After the loss to North, the Tigers went on a five-game winning streak. During the streak, most of the games were blow-outs. South defeated Edison 71-23. Roosevelt was the next victim, in a very close 46-42 game. Southwest was drowned 61-38. The Millers lost for the second time, 52-41. Finally, the Patriots did not have any success in a 71-29 loss. Going into the rematch with North, the Tigers were in first place. Their only loss was to North. North lost two games, one each to Roosevelt and Washburn. The Tigers were looking for revenge. However, revenge was not in the cards. The Polars again won, this time by a 50-39 score. Now, there was a two-way tie for first place between South and North. South returned to the winning form beating Edison 79-31. The next opponent the first-place Tigers faced were the Teddies from Roosevelt. Roosevelt was one game behind the co-leaders. The first game was extremely close. This game the Teddies earned some revenge and knocked the Tigers out of first and into a second-place tie. The final score wa Roosevelt 45, South 38. Three non-conference game scores were reported. All three were victories. The Tigers beat St. Paul Highland Park 62-28, St. Paul Johnson 71-16 and St. Paul Central 57-48. The future looks bright for the Tigers with the JV winning the JV Conference title and going undefeated! Coach Kern was assisted this year by Shelly Schoeberl, V. Dinius and S. Tennessen.